The DC CFAR, Emory University CFAR, and NIH were pleased to co-host the CFAR Adelante Program Mid-Cycle Workshop that took place on Tuesday, December 11, 2018 at the NIH offices in Bethesda, MD. This workshop brought together all of the current Adelante program grantees to share research progress, discuss best practices, and strategize around next steps following the completion of their projects. DC CFAR investigator, Dr. Ana Maria del Rio Gonzalez, participated in the meeting, giving an update on her Adelante project entitled "Factors associated with PrEP intentions and use among Latina immigrant transgender women in the DC metropolitan area". DC CFAR SBS Core Co-Director, Dr. Maria Cecilia Zea, also gave a presentation on the challenges in conducting HIV research among Latinas and Latinos. 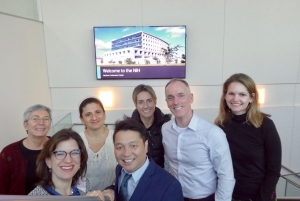 Pictured in the photo from left to right are Maria Cecilia Zea, PhD (GWU), Julie Levison, MD, MPhil, MPH (Harvard), Ana Maria del Rio Gonzalez, PhD (GWU), Mariano Kanamori Nishimura, PhD (FIU), Claudia Martinez, MD (University of Miami), Stephen Fallon, PhD, Executive Director of Latinos Salud, and Susanne Doblecki-Lewis (University of Miami). Click here to learn more about the CFAR Adelante Program.